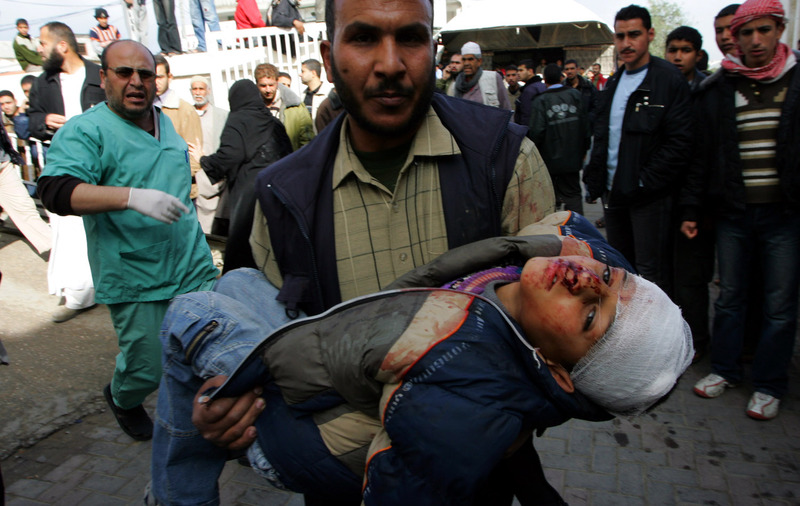 Ten years ago today, on December 27, 2008, Israel launched Operation Cast Lead against the Gaza Strip — a twenty-two-day affair that ultimately dispensed with some 1,400 Palestinian lives, among them more than three hundred children. In other words, perhaps, the slaughter of innocents was not just fun and games — it was also crucial to Israel’s “liberation” from the people it had occupied and abused for no fewer than six decades, since the violent establishment of Israel on Palestinian land in 1948. The Israeli fatality count from Cast Lead totaled three civilians and ten soldiers (four of them from friendly fire), which put the ratio of Palestinian civilian to Israeli civilian deaths at 400:1. Predictably, however, Israel unfurled its signature brand of criminal illogic to claim the role of victim, portraying itself as under attack from Hamas rockets despite the negligible damage inflicted. The victimhood effort got a helpful boost when the Israeli Ministry of Foreign Affairs opted to include 584 victims of “shock and anxiety syndrome” in its official Cast Lead casualty tally — although we can safely assume that shock and anxiety in Israel are often a result of the government’s obsession with air raid sirens and other forms of politically expedient fearmongering rather than any actual physical threat. Western mainstream media outlets, ever-reliable conduits for Israeli propaganda, explained Cast Lead in the same way they explain all Israeli onslaughts: as “retaliation” for some Palestinian offense. In this case, Hamas was accused of breaking a ceasefire by firing rockets into Israel — even though the rockets (which injured no one) were themselves a response to Israel’s lethal, ceasefire-violating raid into the Gaza Strip. The media’s insistence on endowing Israel with a perennial monopoly on retaliation obscures the reality that any Palestinian action against Israel is fundamentally a reaction to Israel’s brutal usurpation of Palestinian territory, institutionalized policy of ethnic cleansing, and habitual massacres. The New York Times’s Thomas Friedman, never one to miss an opportunity to cheerlead US- and Israeli-induced bloodshed, reduced Cast Lead to “the latest version of the longest-running play in the modern Middle East, which, if I were to give it a title, would be called: ‘Who owns this hotel? Can the Jews have a room? And shouldn’t we blow up the bar and replace it with a mosque?’” Of course, seeing as Israel has long helped itself to all the rooms in the hotel, it seems there are other, better questions to be asked — like how we might replace Thomas Friedman. As the slaughter in Gaza proceeded apace, Friedman surfaced once again with the suggestion that Israel reprise its summer 2006 performance in Lebanon, where the Israeli military (IDF) had killed an estimated 1,200 people, primarily civilians, over thirty-four days. Endorsing Israel’s decision to “exact . . . pain on the civilians” of Lebanon — a strategy he said “was not pretty, but it was logical” — Friedman prescribed similar war crimes for Gaza. Flesh-incinerating white phosphorus was but one of the incoming materials with which Gazans had to contend. In a dispatch from Gaza published on January 16, 2009, Irish activist Caoimhe Butterly recounted some of her experiences accompanying Palestinian ambulances during Cast Lead — no small feat, given the Israeli tradition of targeting such vehicles and the paramedics within. The ambulances were variously summoned to hospitals under Israeli attack and Palestinian homes on the receiving end of Israeli missile strikes. As we drove slowly around the area, we heard women’s cries for help. We approached their house on foot, followed by the ambulances and as we came to the threshold of their home, they rushed towards us with their children, shaking and crying with shock. At the door of the house the ambulance lights exposed the bodies of four men, lacerated by shrapnel wounds — the skull and brains of one exposed, others whose limbs had been severed off. The four were the husbands and brothers of the women, who had ventured out to search for bread and food for their families. On the tenth anniversary of Cast Lead, it’s crucial to recall that the operation, while a major milestone on the timeline of Israeli barbarity, was hardly an isolated incident. To highlight just one other episode of Israeli butchery in Gaza: Operation Protective Edge, in 2014, eliminated some 2,251 Palestinians in fifty days, including 229 women and 551 children. Six Israeli civilians were killed, but, you know, Israel was still the victim. Now, with Israel preparing for its next big showdown, it appears even greater horrors are in store. The head of the IDF’s Homefront Command recently warned that any future war with Gaza or Lebanon might keep the residents of Tel Aviv from blissfully sipping coffees in their favorite cafés. But as we embark on this new decade of Israel’s “national liberation” — with anti-Palestinian savagery facilitated by billions of dollars in annual military aid from the US — it’s not just the Israelis who need to wake up.